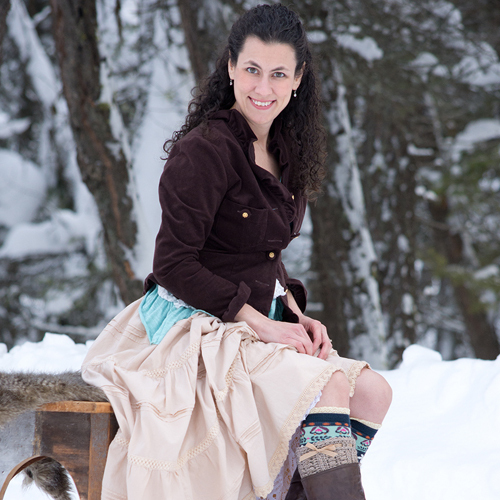 Part of this crochet pattern’s warmth comes from using a thicker, worsted weight yarn, and its lacy texture actually helps trap warm air, keeping you comfortable and looking cute at the same time. Win-win! 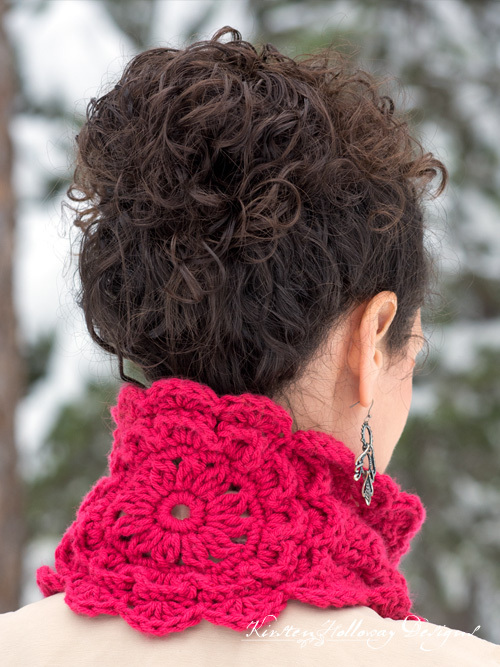 The details on this beautiful Victorian style neck warmer start at the back with the flower (the name of this cowl is actually inspired by a variety of peony! ), then the sides are added one at a time. It is possible to make this longer if you wish, and I’ve included notes on how to do that, below. 3 7/8” or 1” buttons. I believe mine were made by “Le Bouton”. 2 dc cluster = dc2tog in the same stitch. After round 4 your circle should measure 3 1/4″ across. Your flower should measure 6 3/4″ across when it is completed before you start working on the “arms” of the muffler. -Caron One Pound is a thicker worsted weight yarn. If you substitute a thinner worsted weight such as Caron Simply Soft, your measurements will be off. -If you want a looser piece, it is possible to make this longer by repeating rows 7-19 as many times as you want. Please work the final rows the same. You will need to increase your shell count accordingly. Round 4: [hdc, 2 dc] in first stitch, [2 dc, hdc] in the next, sl st in the next *[hdc, 2 dc] in first stitch, [2 dc, hdc] in the next, sl st in the next* (12 petals) Note: your edge will be rippled and not lay flat. This is ok. Turn piece sideways and work this row along the side. Row 23: work 5 shells along the side of the cowl, using the shells from round 6 as a guide. I skipped about 1/4” between slip stitches and 5 dc shells. Your final slip stitch should be between the shells from round 6. Your cowl should measure about 14” long at this point. Turn cowl over so you are begin working round 7 on the back side. Attach yarn to opposite side of flower, skipping 3 shells. This will be opposite the part you just completed. Repeat rows 7-19 one time, and then do one more repeat of rows 8 and 9. This will give you one more row 8-9 repeat than the other side of the cowl has. Turn and work next section down the side of the cowl. Work 6 shells along the side of the cowl, using the shells from round 6 as a guide. I skipped about 1/4” between slip stitches and 5 dc shells. Your final slip stitch should be between the shells from round 6. Attach yarn to other side of cowl closest to the flower, work 6 shells down the side. Attach yarn to other unfinished side of cowl, closest to flower, work 5 shells along the edge, put 2-3 sc at the end to finish out the row. Sew 3 buttons to the first side of the muffler that you completed, on sc rows. Wear and be cozy! Get compliments on flower at the back of muffler when you wear your hair up. Feel beautiful, because you are. 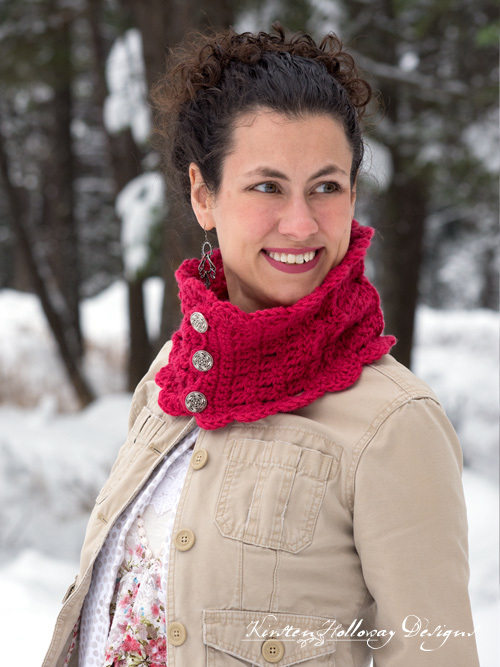 If you enjoyed this pattern, don’t forget to sign up for my newsletter here! That way you’ll never miss out on special events, or freebies I’m offering. You are welcome to share the link to this pattern, using one image of your choice, on your site, but please do not share the written patterns themselves, or use additional images. You may not use my images to promote your finished products. If you’re selling finished pieces, your work should be of good enough quality that you feel confident in showing it, right? 😉 Thank you! When you purchase something using these links a small amount of the sales price goes to me to help keep this site, and the patterns on it free. You do not pay any extra for the item you purchase. How cool is that?! Hi kirsten after row 13 repeat 12&13 is row 14&15 then repeat row 8&9 2 more times will be row 16 .17. 18.&19 where is row 20? Please check thanks. …. Thank you for your sharp eyes, Gwen! It should be fixed now! You’re welcome! I hope you have fun making it! 😀 Feel free to share a picture in my Facebook group when you get done! Thanks! Another gorgeous, girly pattern. I have a family reunion coming up this week, and I’ve made quite a bit of your creations as gifts 🙂 not sure where you are that you’ve already had snow, but good luck for this winter. Quebec has had only frost so far where I’m at (snow shouldn’t t be too far away). Reunion is in Georgia! Woohoo thanks again for this gorgeous pattern! Enjoy your trip to warmer climates! Since you begin and end row 8 with a 2 dc cluster it should be an odd number of stitches, so basically that would look a little like this if I were to chart it out with – being a chain, and 2dc being the cluster: 2dc-2dc-2dc-2dc-2dc-2dc-2dc-2dc. So yes, you will have the 2dc cluster 8 times, but the ch 1 only 7 times (the ch 1 to turn is not counted in this row). I hope that helps! Good luck on the rest of your project! No worries! Yes, it’s 2dc in the same stitch-not a decrease. I’m so glad you got it figured out! 😀 Enjoy the rest of the project! This might seem really a dumb questions, but I am a bit confused. After making the circle, and doing 12 sc into it the instructions say to dc cluster. Which if I understand correctly it is the same as dc2together. But, dc2togehter is the as a decrease. How do I do a decrease right away into the same stitch as the ch stitch? I am sure I am misunderstanding this, but I can’t figure it out. The dc cluster is basically a dc2tog but in the same stitch, not across two different stitches. This way it’s not a decrease. 🙂 Hopefully that helps clarify! Please clarify for an advanced beginner Row 7. If I have 12 shells made with the 5DCs in Round 6 , how am I arriving at 15 in Row 7 if I HDC in each of the 5DCs I used to make shell in previous row? What am I HDC-ing into ? NOT each DC in Round 6 because that would mean 60 HDCs! Can you explain it a different way and take mercy on a novice? I love the pattern so far. I love this pattern, and I have some leftover yarn in just the right colour! Making one for my mum, but I know that I’ll end up making one for myself, too. 🙂 Thank you for this! You’re welcome! I hope you both enjoy wearing them!